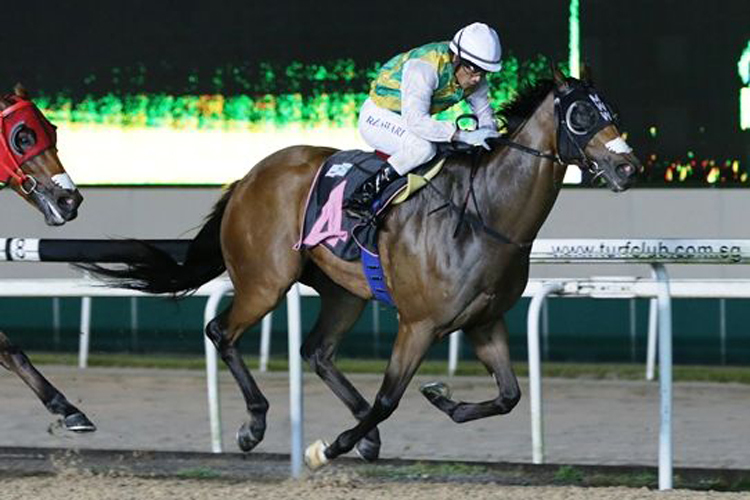 Distinctive Darci shapes up as a strong chance when he lines up in the Kranji Stakes A over 1000m on the Polytrack on Sunday. The Mark Walker-trained runner returned to the winners circle with a nice one length win over Nova Missile in the same company last start (1200m) and looks well suited again today off that effort. With Vlad Duric back on board, the four-year-old gelding will need a little bit of luck from the wide draw but if he can find some cover in the second half of the field he will be getting to the line very strongly. Most recent effort over the 5 f trip came when runner up to Nova Swiss in a Kranji Stakes A late last year and is rarely too far away in these sorts of races. Running to a career peak Timeform figure of 96 last start, if Distinctive Darci can run up to that level again today he will certainly be very hard to hold out in this field. Autumn Rush did not have a great deal of luck last start when caught wide in a Kranji Stakes B, tiring late to finish midfield. Form prior to that was very good when winning a strong Class 3 over this C/D, running on very well from back in the field. With four wins from his 12 career starts, The Steven Burridge-trained runner still looks to have improvement to come and is very lightly raced for a five-year-old. Should get a very nice run from barrier 2 today and if he can run up to his previous best he is not without hope against these down in the weights. Al Green has been racing better than his recent form suggests and should appreciate the drop back to the 5 f for this where he has a solid record. Won a recent barrier trial in preparation for today and with Glen Boss on board down in the weights expect a very strong showing in this. Constant Justice rounds out the main chances with five of his seven previous wins coming over the 5 f dash. Willing to forgive his last start effort when beaten a long way behind Distinctive Darci in a run that was too bad to be true when in the market. Won his start prior to that over this C/D in a Kranji Stakes B, returning a Timeform figure of 94 and that will be good enough to be very competitive in this field. Won a recent barrier trial and from the inside draw should be right around the mark.